Typical of rural universities with an emphasis upon agricultural science and veterinary medicine studies, Washington State’s remote location in Pullman has traditionally made it difficult to recruit successfully against the other more cosmopolitan conference schools. Yet those taking the plunge have blossomed in an environment where team spirit and toughness have often overcome daunting odds. Though the suspension helmet era did not see great Cougars teams, they often played solid football since the program’s inception in 1894 and maintained a reputation of sending players into pro football both in the United States and Canada. Earlier, Washington State could claim some greatness including a National Championship in 1916. 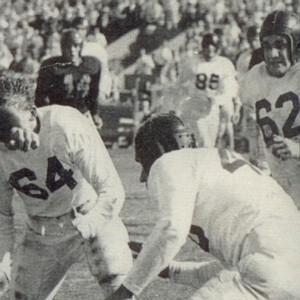 The teams coached by College Football Hall Of Fame legend Orin “Babe” Hollingbery knew only two losing seasons in his era that stretched from 1926 through 1942 when the program was disbanded due to World War II. He took his great 9-0 1930 team to the Rose Bowl against Alabama with star players center Mel Hein and Albert Glen “Turk” Edwards. Like their coach, both of them also found their way into the College Football Hall Of Fame and they then doubled their status with entry to the Pro Football Hall Of Fame. When the post-war program was restarted in 1945 former Cougars’ star Phil Sarboe was brought back into the fold after a professional career with the Redskins, Cardinals, and Dodgers, and a head coaching stint at Central Washington University. He began well in 1945 but after five years, he took his 17-26-3 record to Humboldt State where he was much more effective and eventually completed his coaching career in 1966 at Hawaii. While at WSU he coached a number of the Cougars’ all time greats including Jerry Williams, tackle Laurie Niemi, end Fran Polsfoot and back Don Paul. Niemi was an All American in ’48, played five years with the Redskins including two Pro Bowl seasons, and returned to WSU as an assistant coach. Williams entered WSU after his military service, was an outstanding record setting back and return man, and was then successful in the NFL. As a coach he continued his success as head man at Montana, Calgary, where he was CFL Coach Of The Year and the Philadelphia Eagles. Polsfoot played with the Cardinals from ’50 through 1952 while Paul who also began his career with the Cardinals as a two-way back through ’53, played on three of Cleveland’s championship teams as a defensive back. By 1949, close observation of the Cougars indicated that while all of the players wore crimson helmets, the standard leather helmet was still used by most but there were quite a few who had instead chosen to wear what was for WSU, the new Riddell RT model plastic helmets. With an upgrade in the uniforms, there was in 1950, a serious effort to upgrade the entire program with a coach who could bring sustained success and with him came the use of the plastic Riddell RT suspension helmet by the entire squad.